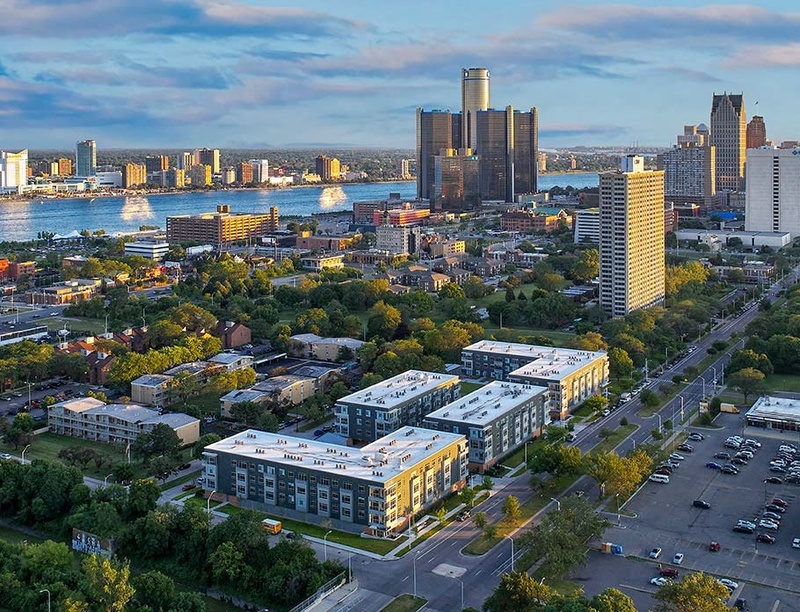 For the first time in 40 years, Detroit’s famed Lafayette Park has a new addition. 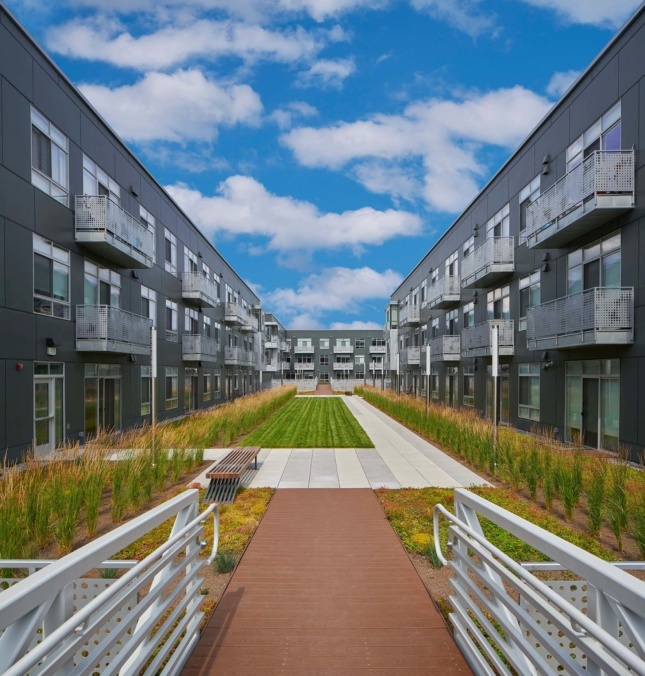 Designed by Detroit-based McIntosh Poris Associates, DuCharme Place is a 185-unit apartment community comprised of four midrise buildings. Adding to the Mies van der Rohe–designed historic district, the new development plays liberally with many of Mies’s original concepts. The long history of Lafayette Park includes the “slum” clearing urban renewal of postwar urban centers, the rise of modernist housing blocks in the U.S., and the realization of one of Mies’s largest housing projects. The first projects to be completed in the development were the Mies-designed Pavilion Apartments and a series of townhouses that are most often associated with the neighborhood. After those initial buildings, a handful of architects, including Gunnar Birkerts and John Macsai, added a school, shopping center, and more housing, with the last major project finishing in 1967. Ludwig Hilberseimer, Alfred Caldwell, and Joseph Fujikawa played an important role on Mies’s planning and design team for the project from the beginning. McIntosh Poris’s contribution, entitled DuCharme Place, draws on many of the modernist ideas designed into the historic portions of the district. Starting with the material palette of brick, metal, and glass, the project also makes larger formal moves that echo Mies’s master plan and design. The four buildings define three large courtyard terraces reminiscent of the iconic courts of Mies’s townhomes. Residents also have access to additional outdoor spaces including private balconies and private green roof terraces, which include a pool and a zen garden. The project’s green roof is the largest in Detroit. 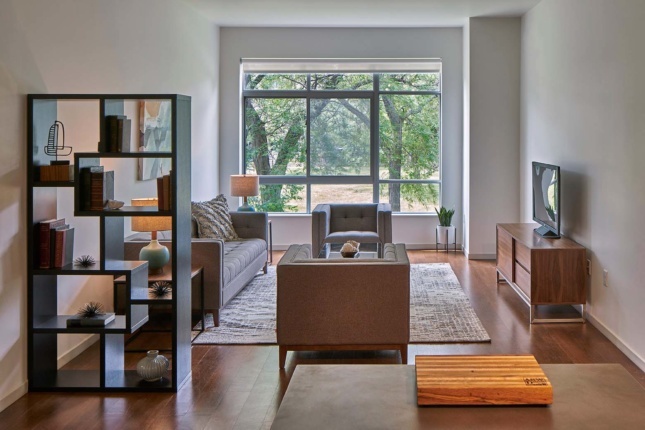 Hoping to attract young professionals, couples, and empty nesters, the projects is filled with one- and two-bedroom units ranging from 500 to 1,100 square feet. Located a walking distance from downtown, the units provide an alternative to the quickly rising rent in the city center. Lafayette Park also has direct access to the Dequindre Cut, a two-mile greenway built on along a former rail line leading to the waterfront. In 2015 Lafayette Park was designated a National Historic Landmark District. Yet, it is not a neighborhood locked in time. 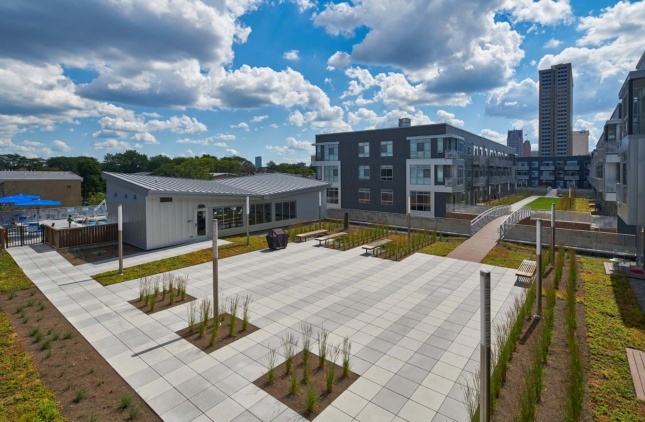 Instead, as it was designed to be from the beginning, it is a living, growing neighborhood.